Age 14/15/16? | 1982/83? Kissus—interruptus. Leia is a very dirty dirty dirty dirty dirty…. (gasp—inhale) dirty dirty dirty DIRTY girl. And so is Han. A dirty boy, that is. Well, that should give my Google page ranking a boost! Oh hello, new readers, welcome to Star Wars age 9—ya weirdos! Obviously that wasn’t my intention! Maybe this is why 3PO has been sidelined in the new Star Wars Movies? Because a huge proportion of fans find him ANNOYING. I don’t actually, I’m extremely fond of him. Always have been. And when he interrupts Han and Leia’s first ever kiss, he’s even more endearing. Endearing because he’s almost like an innocent child. So, I do hope that Disney re-think the way they’re apparently edging 3PO—and R2 and Chewbacca out of the new films. 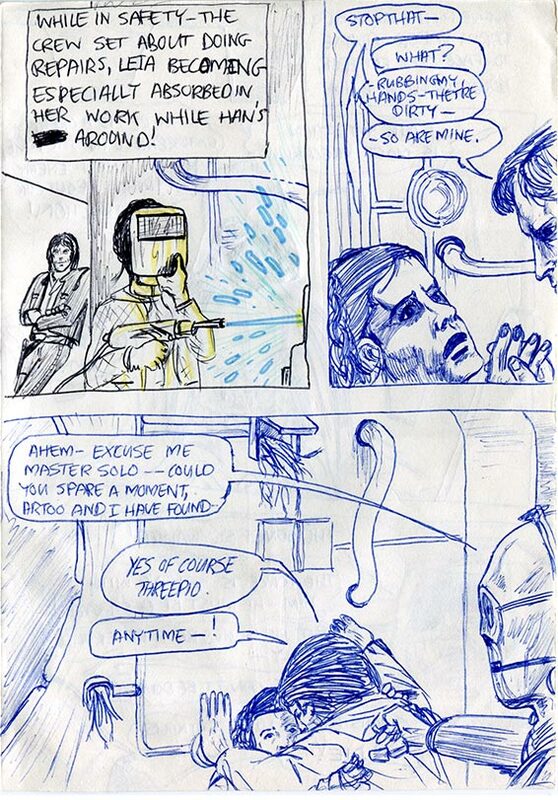 Unlike in the majority of his appearances in my comics (admittedly), Threepio is capable of far more than just whimpering “Oh dear…” and “Oh my…” and hiding in corners.